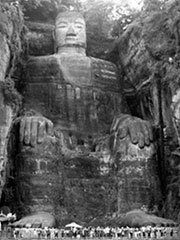 The Leshan Giant Buddha (樂山大佛, pinyin Dà Fó) is the tallest stone Buddha statue in the world. It is carved out of a cliff face that lies at the confluence of the Minjiang, Dadu and Qingyi rivers in the southern part of Sichuan province in China, near the city of Leshan. The stone sculpture faces Mount Emei, with the rivers flowing below his feet. Construction was started in 713, led by a Chinese monk named Haitong. He hoped that the Buddha would calm the turbulent waters that plagued the shipping vessels travelling down the river. When funding for the project was threatened, he is said to have gouged out his own eyes to show his piety and sincerity. Construction was completed by his disciples ninety years later. Apparently the massive construction resulted in so much stone being removed from the cliff face and deposited into the river below that the currents were indeed altered by the statue, making the waters safe for passing ships. The Mount Emei Scenic Area, including Leshan Giant Buddha Scenic Area has been listed as a UNESCO World Heritage Site since 1996. Seventy-one metres tall, the statue depicts a seated Maitreya Buddha with his hands resting on his knees. His shoulders are twenty-eight metres wide and his smallest toenail is large enough easily to accommodate a seated person. There is a local saying: «The mountain is a Buddha and the Buddha is a mountain». This is partially because the mountain range in which the Leshan Giant Buddha is located is thought to be shaped like a slumbering Buddha when seen from the river, with the Leshan Giant Buddha as its heart.